Students Speak: "Why do you love anthropology?" "Returning From Abroad" - EAP undergrads share experiences and insights. Submissions are published on a rolling basis throughout the year, culminating in a print edition in the spring. 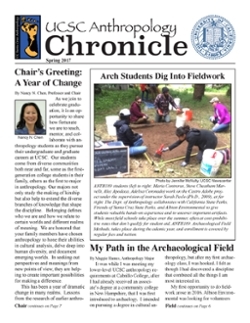 To submit a story, please email rgrad@ucsc.edu.